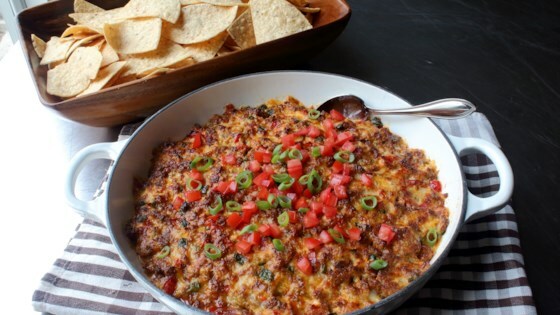 "Bake this creamy chorizo fundido for an easy and impressive party snack. Garnish with chopped tomato and green onion and serve with tortilla chips." Place chorizo, green onions, red bell pepper, poblano chilies, and jalapeno in a cold skillet. Turn heat to medium-high. As skillet comes up to temperature break up chorizo into very small pieces. Continue cooking until sausage is browned and peppers are barely cooked through, 4 to 6 minutes. Remove from heat. If sausage releases a lot of grease, mop up some with a paper towel. Mix cream cheese, sausage mixture, Monterey Jack cheese, Cheddar cheese, and sour cream in a bowl. Transfer to a shallow, heat-proof baking dish. Broil on high until browned and bubbly, 5 or 6 minutes. Great as a dip. Could easily add avocado as a garnish. An absolute do over.